Note: As I mentioned last month, we've added a great new product to our online store, BJI contributing writer Kenneth Smith's new Advanced Strategy Cards For Card Counters. If you are a card counter, or thinking of becoming one, you need to read Ken's article in this issue (and last month) for the details on what these new strategy cards entail, and how to use them on the tables (or for practicing card counting at home). Ken spent the better part of two months developing the index numbers for the cards. (Trust me, you won't find a more accurate set of indices based on the playing rules and the number of the decks, anywhere.) These cards are a winner and we have them on sale! Loudon Ofton is a high-stakes blackjack player, who must often carry large sums of money through airport security. This month he offers tips on how best to do this. For low-stakes players, you might benefit from reading my article on how to get and manage your cash when gambling in a casino. Stu D. Hoss reports on playing conditions at The Quad and Harrah's Casinos on the Strip, and KC Brooks reports on playing conditions in Reno. Frank Scoblete completes his two-part article summarizing his one-day visit to every casino in Atlantic City. John Grochowski answers reader's questions on comps at blackjack, memorizing penalty cards for video poker, and how the mystery jackpot is triggered at slots. If you want learn what a royal flush cycle is in video poker, read my article that explains it and how it can affect your bankroll. Last but not least we have a summary of upcoming blackjack tournaments across the U.S. by www.blackjacktournaments.com (there are more tournaments scheduled than usual). Note: Send us your feedback on playing conditions (good and bad) that you observe when you play blackjack and we'll publish them in the BJI in our new Reader's Feedback on Playing Conditions section. Send to HTamburin@aol.com. This set of 12 strategy cards contains not only an accurate basic strategy but also accurate indices for the Hi Lo counting system. This an excellent tool for anyone thinking about becoming a card counter (use the cards to learn the index numbers), and for current card counters, who want accurate indices based on the number of decks and the playing rules (you'll have the index numbers at your fingertips when you play). 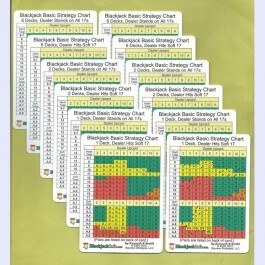 You can read about these new strategy cards in the article by Ken Smith in this issue of BJI. We've added these new strategy cards to our BJI online store and discounted them. This is a "must have product" for serious blackjack players. Copyright ©2013, Jerry King, www.jerryking.com. All rights reserved. This informative article appeared in issue #70 of BJI and is a must read for anyone who bets on sporting events. E-mail subscribers can also read each month's issue online at our web site: BJI Issue #160, May 2013. Join the ranks of savvy blackjack players who get the edge over the casino, without the need to be a mathematical genious and months of training! These software bundles contain absolutely everything you need to become an expert card counter, with a focused training regime including pass/fail exercises so you know when you are ready to hit the casinos. in one App for Android and iPhone! Play Blackjack with advanced casino options AND learn to count cards at the same time! Blackjack Expert teaches you card counting techniques while playing against the computer, or using one its many training modes. This is a professional blackjack training package, containing everything you need to go from beginner to seasoned card counting expert. Blackjack Expert is a game simulator and testing tool combined in one easy-to-use program. As you play blackjack, your decisions are tested: actions, index plays, bet sizes, and insurance. The software is packed with advanced features for mastering every aspect of Blackjack card counting. Whether you're just looking for a great Blackjack game or looking to learn card counting techniques, Blackjack Expert is the fastest way to improve your game. Card Counting can give you a statistical edge over the casino. Blackjack Expert contains all of the powerful blackjack training features and drills our users have come to enjoy and expect in our products. The user interface has been greatly enhanced and simplified to leverage the great features of the Android and iPhone, making mastering card counting strategies on the go even easier! The complete Speed Count system is included with the base application. Or, purchase the complete HighLow count system and others as In-App purchase right inside the software (Add-ons mode), installed immediately into the program. The new Rules mode lets you select the game rules and count system, and a matching action table and index set are selected automatically. Create and edit your own count systems from Rules mode. All the powerful high-end features you've come expect from our products are available for Android and iPhone. 144 built-in basic strategy tables for non card counters, selected automatically as you change the rules. Extensive, context-sensitive help built right into the application. Supplementary documentation on card counting will help novices learn what it is all about. 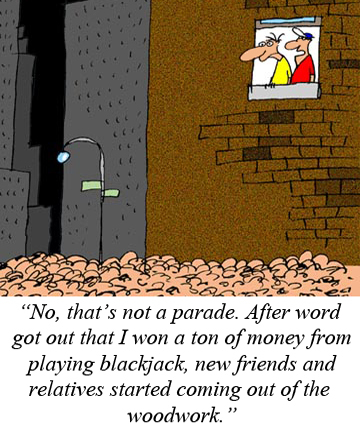 No need to purchase anything else to master card counting! Simplified settings for Count mode to configure deck counting drills, while all options are still available for advanced users. Also available... Blackjack Mentor for Android and Blackjack Mentor for iPhone. "This is a great TEACHING progam not a game, learn Basic strategy, counting, different count systems, rules. As they say 'Its all in there'." "This app is perfect. There's no other app like it." "An excellent app to improve play. Absolutely no glitches!" "Glad to see this program on the Droid Platform. Works great!" "The new Advanced Blackjack Strategy Card set of cards focuses on six different rule sets and provides an optimized basic strategy for each of the games, just like our popular basic strategy set. Even though each card is titled simply "Blackjack Basic Strategy Chart," a close examination might lead to questions that you would prefer not to be asked. That's why the set also includes a "stealth" version of each card which encodes the index information in a far less obvious fashion..."
"I played professional blackjack for six years. During that time, I went through many airports, usually carrying upwards of $60,000 in cash. I never had my money seized. I never missed a flight..."
"What's the one thing you positively must have if you want to gamble? Of course, c-a-s-h. Most folks just use folding money. Nothing wrong with that, but there are other options, some better, some worse. They include..."
"This report reviews the playing conditions at the following casinos: Atlantis, Boomtown, Eldorado, John Ascuaga's Nugget, Peppermill, Siena, Sands Regency, and Western Village..."
"This month I ventured to the Strip to check out the playing conditions, and progress on the remodeling and rebranding efforts, at The Quad, and stopped in at its next door neighbor, Harrah's..."
"On Sunday evening, Jerry "Stickman" and I headed to Atlantic City. We had two goals in mind for our five days of playing - obviously winning money but also taking our own personal Odyssey of all the casinos on Tuesday. We'd start at the Atlantic Club, the southern most casino on the Boardwalk, making our way from casino to casino all the way north to Revel. Here is what we discovered..."
""I've been going nuts trying to memorize penalty card exceptions in video poker. How important are they? Would I be just as well off to use a simpler strategy..."
"One of the most misunderstood concepts in video poker is "the royal flush cycle." It's important if you want to be successful at video poker that you understand what this is, and how it can affect your bankroll..."
"Check out the schedule of upcoming major blackjack tournaments by region in our Blackjack Tournament Report courtesy of blackjacktournaments.com..."